I have had many garage sales or yard sales in my life. I have raised money for my family, for my kids to go to youth camp, for the youth group to go on trips. I have raised a lot of money with all sorts of sales. So, that left me with a lot of yard sale tips. If you’re holding your own garage sale to make extra cash, you might like to budget that money. Click here to get your own free printable Monthly Budget Worksheet. Here are some of the tips I have found helpful when holding my own garage sales or yard sales. I have made you a FREE Printable Garage Sale Checklist to go along with this post, too! Whether you’re just needing to do a thorough clean out of the attic or you need some extra cash. You need to set a goal as t how much you need or want to earn. Choose the best date(s) and time(s) for your sale. If you want to run it for 2 -3 days in a row, or 2 consecutive weekends. Maybe you want to run it Thursday through Sunday, choose what works best for you. Many cities have rules governing yard/garage sales. Be sure you know if you need to get a permit and what the rules at for when and how you can run it and when and how you can post signs for your sale. Now it’s time to gather your items. Go through the kids clothes and pull out any that they have outgrown, toys, books, and movies, too. Look through your kitchen and garage and your own closet. Be sure to ask family, friends, and neighbors if they have things they’d like you to sell for them. Next check your items and make sure they are sparkling clean and ready to be sold. Plug everything in and make sure they work, makes sure they have all of their parts, repair any items that you can. Make sure to sort everything prior to the sale so it’s easier on the morning of to put all like items together. You may need to borrow folding tables from friends, and family to put your items on. Gather some boxes or bins to hold items, make sure you have extensions cords ready and plugged in for your buyers to see that your items work prior to purchasing them. Whether you’d prefer a money box, money bag, or a fanny pack you can wear the entire time, be sure to have this figured out and available ahead of time. You can purchase whiteboard or poster board at the dollar store along with markers and make some great signs. Think about investing in a few signs, instead of the cardboard that gets blown away or ripped. Check out some of the best yard sale signs here. Start collecting plastic grocery sacks and boxes for people to carry MORE of your treasures home in. If you are pricing things you’ll need markers and price stickers, also keep a notebook handy to keep track of any notes you may need ie: you’re selling things for friends and family and need to write down what they sold for, or the lowest price they will accept. Also don’t forget the calculator which will come in handy for those multiple purchase sales. Gather newspaper, used tissue and wrapping paper to wrap breakables in for your buyers. For some reason buyers often like to wander off into areas where things aren’t for sale… so make sure you rope off areas that are off limits and keep an eye on those areas, as well. If something has been sold and not picked up, yet, or something in the yard or garage is NOT for sale, be sure to put a sign in clear view that the item is not for sale. This one will save your sanity when the 50th person in the first 2 hours asks you how much the not for sale item is. If you have chosen to price everything or some things make sure to use price stickers and mark them all with the same color ink and make the stickers visible. The same color ink ensures no one tries to change one of your stickers. Time for the sale to begin, get those signs out, put on your best buyer friendly smile, and collect your earnings! Good luck and have fun meeting new people! I hope these tips help with your future yard sales. 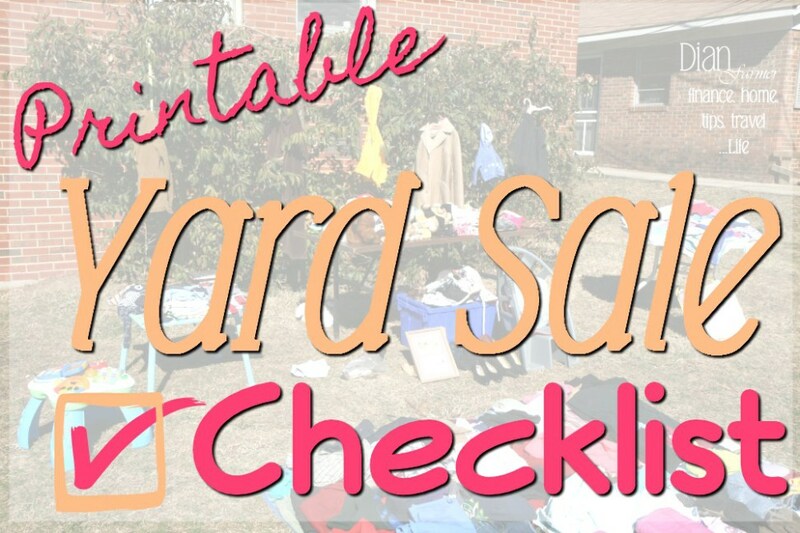 I have hosted many yard sales to date and most of these tips and the Printable Yard Sale Checklist I made for you comes from the experience I got from sales I have done.